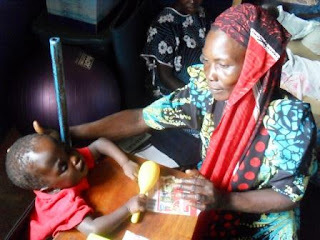 Evert thursday we recieve 15-20 children who attend our drop in clinic for developmental therapy. The idea of drop in clinics is to encourage the parents to come together every week to attain developmental therapy and to learn from one another how to assist their children to come to a new level. Drop in clinics have been a real encouragement to parents, many have realised that they are not alone and that they other parents go through similar challenges to them. There has been many times where mothers have been able to encourage one another through parent to parent counseiling.Mothers have come to a drop clinic dishearted, through a conversation with another mother they have left with a smile on there faces and with a lighter heart. Ouma Lawrence is 3years old, when Ouma was three months old it was visible that his head was growing rapidly and the fontanel was becoming soft and large. The parents came to the SOH office for advice, the mother was advised to go to a local hospital for surgery. Instead, the parents decided to visit other places instead and evidentially went back to the hospital where they had the surgery. Lawrence is able to see and hear well, he is unable to feed himself, and he poor head control when sitting, and is currently unable to sit independently. The SOH OT is currently working with Lawrence in the area of sitting, feeding and head control. It looks like Lawrence has a great future ahead of him, when you are able to start working with a child from a young age it makes all the difference to what developmental levels the child will achieve. Kasto Brian is 14 years old boy who lives with his grandfather. Until Brian was four years old, he was able to walk, run and climb tree like other boys his age. One day he wanted to eat jackfruit, a very sweet fruit which grows on trees, the only Brian could get this jack fruit was to climb the tree. Therefore, he climbed the tree and sadly, instead of getting the jackfruit he wanted he fell down from a high branch of a tree. Brian was taken too Kayunga hospital for treatment. Kayunga referred him straight to the main government hospital Mulago, in Kampala Uganda’s capital city to see if they could help. Brian spent three months in Mulago undergoing treatment and therapy; when Brian left Mulago he was able to use of his left side. The doctor told Brian to go to Mulago, twice a month to continue with therapy. His grandfather deeply wanted Brian to continue to get the support he needed but did not have the money for the transport a four hour round trip twice a month. Brian stopped receiving therapy and his Grandfather was sad and frustrated and saw no way forward. Since Brian’s accident, he has spent much of his childhood at home, unable to go to school, lying on a mat. One day his grandfather was told about SOHUG and they would be able to help Brian. His Grandfather felt relieved and came to the office of Spring of Hope. 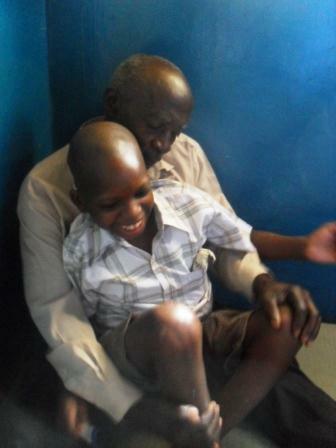 The day Brian and his grandfather came was a drop in clinic; his grandfather was so excited and felt hopefully. Brian is now waiting for his special chair to be ready, so that his days of lying on a mat are over instead he will be able to sit with support. His Grandfather said he would be coming every week to the drop in clinic. Both Brian and his Grandfather feel relieved and see a new future ahead for Brian.